This item is not eligible for Amazon Prime, but over a million other items are. Join Amazon Prime today. Already a member? Sign in. Covers all the most recent XML core and related specifications including XML 1.1, J2EE 1.4, Microsoft .NET's latest iteration, as well as open source XML items from the Apache project. Strong coverage of XML use with databases, transactions, and XML security. Discusses both Microsoft (.NET) and Sun (Java) programming integration with XML, an approach not taken in any other book. Presents extensive business examples, including several major applications developed throughout the book. No previous exposure to XML is assumed. * Covers all the most recent XML core and related specifications including XML 1.1, J2EE 1.4, Microsoft .NET's latest iteration, as well as open source XML items from the Apache project. * Strong coverage of XML use with databases, transactions, and XML security. * Discusses both Microsoft (.NET) and Sun (Java) programming integration with XML, an approach not taken in any other book. * Presents extensive business examples, including several major applications developed throughout the book. * No previous exposure to XML is assumed. What Do Customers Ultimately Buy After Viewing Items Like This? 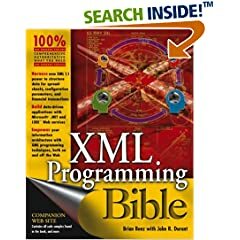 As a follow-up to the XML 1.1 Bible review, I took a look at the XML Programming Bible by Brian Benz with John Durant (Wiley). For those who want to use XML within their application development (as opposed to just web pages), this is the perfect follow-on book to have. Seriously, there's really good material here. The assumption is made that you already understand basic XML technology. Benz doesn't spend an inordinate amount of time covering introductory material. Part 1 does do a bit of that, but only enough to establish the basic direction for the rest of the book. There is much more attention paid to XML concepts that come into play for programmers, such as the document object model of XML and how the two types of parsers (DOM and SAX) work. The rest of the book is highly practical, with examples of how to generate or access XML data using a variety of platforms, such as Microsoft Office, .Net, J2EE, Oracle, etc. For me personally, I appreciate the emphasis on code and working examples. I have always learned more by taking something that works, tearing it apart, and using it as the basis for my own efforts. Benz has provided many examples that provide just that opportunity. Being that he doesn't restrict his writing to a single platform (like .Net or J2EE), this is one of few books that have a cross-over appeal to many technology platforms. If you happen to work in a shop that uses both Microsoft and Java technologies, you'll be able to get a single book that will assist you on both sides of the fence. Basically, there's nothing I can find fault with for this book. It's solid writing of essential information you need for using XML in your various applications. This is a book that gets my highest recommendation. This book does a great job at describing XML. It does not contain any exercise (although it contains some codes) to help you get your feet wet. This is a good reference book. If you are a beginner, you will still need another book to help you get started. Because I do a lot of XML and XSLT my shelves are littered with XML and XSLT books. Although the information I am looking for is somewhere on the shelf, I sometimes have a hard time finding it. The first part of the XML Programming Bible largely fixes this problem. It provides the core information in an easy to find manner. For example, the XML Schema (XSD) elements are alphabetically listed as a group instead of broken out on the basis of there task. It also includes the type of minutiae I occasionally can't avoid - like the long list of the current DOM working drafts. This part of the book hit the right slot for me between a primer and deeper reference texts that sometimes obscure basic information with more details than I want to accomplish a given task. The second and third sections offer an overview of using XML in Office and J2EE respectively. The fourth section is an overview of interacting with relational data. This part is a light reference into technologies like SQLXML but it should be enough to get you started, such as interacting directly with SQL Sever with FOR XML and updategrams. The book ends with four sections on Web Services. The nice thing about the WebServices sections is that it covers a bunch of technologies used on both .NET and Java/Unix platforms. The coverage of individual technologies isn't deep, but it's enough to understand the basic approach and capabilities of each tool. I don't need this type of information often, but nothing previously on my shelf covered this range of technologies. This isn't a book for rank XML beginners. It doesn't spend waste explaining well-known fundamentals or the grisly history of schemas. Nor is it an in depth reference on any of the topics it covers. But it captures the depth I need when I'm trying to remember some specific piece of information, need a quick review, or need to dive into something I haven't done before - like working with XML from Excel. Brian covers the topic areas complete, with examples and walkthroughs. Anyone who will touch more than 1 or 2 implementations of XML should have this book in their library. Wrox XML/related topics books: A list by J. Minatel "jimmin"
XML Exchange Markup Language: A list by Golden Lion "Reader"
Be a Web Designer and Macromedia Expert...: A guide by "mindwarper"